Font Awesome Symbol You may have been curious about an entry in the new Insert menu named Font Awesome Symbol. Here’s the scoop. 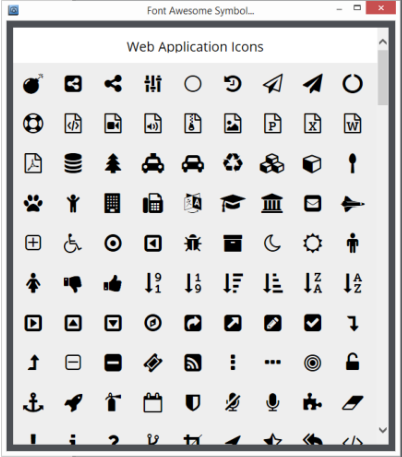 Designer Pro X10 has a library of icons that you are going to love. The library includes 439 icons and includes: Web Application Icons, Brand Icons, Text Editor Icons, Spinner Icons, File Type Icons, Form Control Icons, Currency Icons, Medical, Directional Icons, and Video Player Icons. You can insert these icons into your text, for example Follow Us on Twitter or Buy now for only 200,000. Insert the Text Tool cursor in the text, and click on any of the icons. Inserted symbols remain as text. You can also insert one or more icons by simply clicking on any of the icons. This adds the symbol in the center of the screen. When you insert an icon with this method, the icon becomes a vector shape that you can scale up or down and handle like any other vector object. NOTE: Because the symbols are small, when you add one by clicking in the menu it is not always easy to see them. They may even be hidden under the menu. How you use these icons is limited only to your imagination.